Located 115 miles east of Albuquerque, the Blue Hole is the best open-water diving destination in the Southwest. Nobody knows how deep the Blue Hole really is. In 1976, a pair of student divers squeezed through a narrow opening at the bottom of the hole’s uppermost chamber, descending to more than 100 feet. As the pair swam deeper, they kicked up a cloud of silt, which obscured the opening to the main cave. Neither made it back to the surface alive; it took a dive team from the New Mexico State Police six weeks to recover the second student’s body. Soon after, the city of Santa Rosa sealed the opening with a grate. When I visited Blue Hole this spring, teams of divers from the New Mexico State Police and the Albuquerque Police Department were dredging the upper chamber. The hole, 115 miles east of Albuquerque in Santa Rosa, New Mexico, is more than 81 feet deep but only 60 feet in diameter, and was formed when the area’s limestone bedrock was eroded and collapsed by an underground aquifer. As I watched, teams of police divers cycled in and out of the water, siphoning out years of silt and rocks deposited from swimmers and the 1976 operation to install the grate. New Mexico’s Blue Hole was formed when the area’s limestone bedrock was collapsed and filled by an artesian well, which pumps out more than 3,000 gallons of water per minute. Photo by Ryan Heffernan. New Mexico may not have a reputation as a scuba diving mecca, but Blue Hole is the best open-water diving destination in the southwestern United States and part of a larger, unexplored network of caves. Groups regularly drive hours from Colorado, Utah and Texas, and over the past several years it has been the object of several exploratory cave-diving missions. 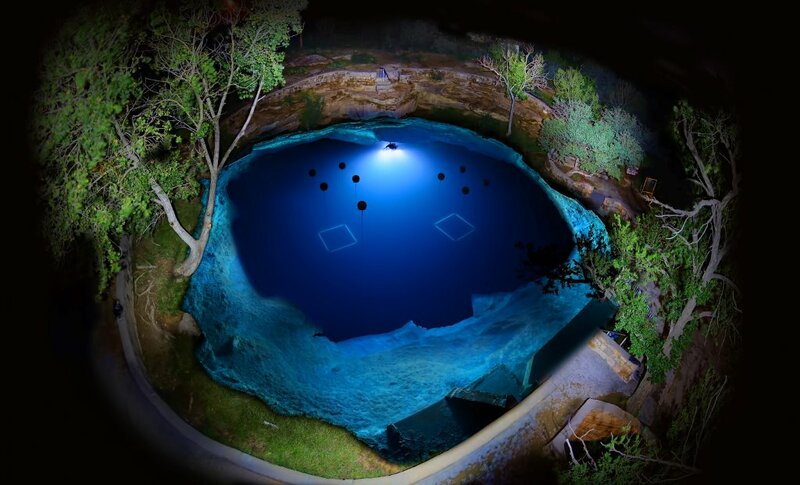 Unlike other lakes and sinkholes in the Southwest, Blue Hole is fed by a powerful artesian well that pumps out more than 3,000 gallons of water per minute — enough to fill an Olympic-size swimming pool every three hours. The constant flow keeps Blue Hole from developing sharp temperature gradients and frees it from a visibility-obscuring algae, common in the region, that can make cave diving dangerous. Elsewhere in the Southwest, says Jason Greene, an instructor at the New Mexico Scuba Center in Albuquerque, “everything turns very green.” In 2013, a team of divers from the ADM Exploration Foundation received permission to remove the grate and explore deeper into the cave system. 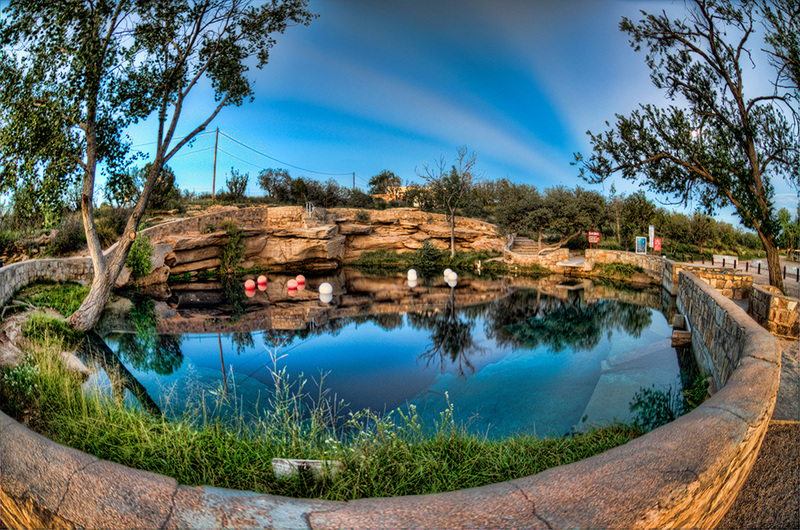 Blue Hole is one of more than 20 lakes or sinkholes in Santa Rosa, several of which help feed the Pecos River. The water that feeds Blue Hole likely comes from the Ogallala Aquifer, and some of Santa Rosa’s sinkholes probably link up hundreds of feet below the ground. According to local legend, the cave system could extend all the way to Carlsbad Caverns, 200 miles to the south, or even to the Gulf of Mexico. If that is true, it makes Blue Hole part of perhaps the biggest system of caves in the world. The 2013 expedition didn’t make it far: Along with the grate, the city of Santa Rosa had dumped a truckload of rocks into the upper chamber, obscuring the tunnel into the lower chambers. The only glimpse of those caves came from the 1976 recovery mission, but there is at least one large chamber more than 200 feet below the surface. The Blue Hole has become a popular destination for swimmers, as well as divers hoping to gain open-water scuba certification. Photo by Ryan Heffernan. Hundreds of non-elite divers and swimmers visit Blue Hole every year, of course. Its 100-foot visibility and relatively confined space allow instructors to keep a close eye on students, making it a go-to location for divers hoping to gain open-water scuba certification. Recreational divers, of course, still won’t venture beyond the upper chamber. Santa Rosa’s 4,600-foot elevation means that an 80-foot dive in Blue Hole is comparable to 100 feet at sea level. 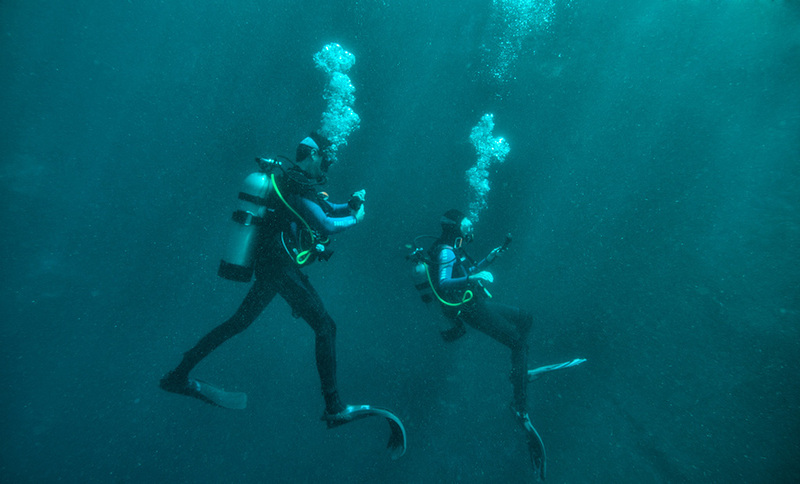 Divers should be careful about traveling too soon after they dive, to avoid decompression sickness — Santa Fe, at an elevation of 7,000 feet, is only two hours away. Sean Greene, who has more than 100 dives at Blue Hole, recommends not flying for at least 24 hours after diving there. Blue Hole has two underwater platforms for divers to decompress while they surface, and the Santa Rosa visitors center has locker rooms and showers for divers who already hold open-water certs. A weekly dive permit costs $20, and a yearly permit is $50. Swimming is free, and there is a small diving platform on the hole’s eastern rim. Blue Hole has given New Mexico a strong dive community, and more than 3,000 divers train at Blue Hole each year. Several dive shops, including the New Mexico Scuba Center in Albuquerque, offer instruction. 7-millimeter-thick wet suit. It also makes for a refreshing swim when midsummer temps hit the high 90s. Is Craft Cider the Southwest’s Next Big (Boozy) Thing?